European retail giant, Metro Group, has become the latest addition to Munich 2018's extensive list of corporate backers. In addition to the announcement, Munich 2018 unveiled an enormous countdown clock at BMW headquarters. 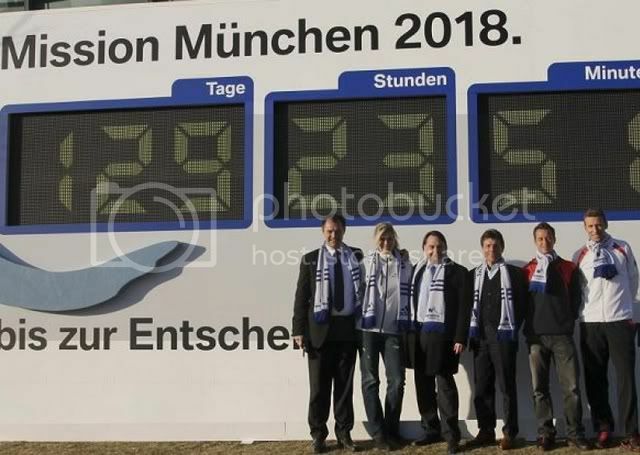 The clock was unveiled over the on Saturday to count down the final days, hours and minutes until the moment when the IOC chooses the 2018 host city between Annecy, PyeongChang and Munich. ‘It is great to be able to unveil this latest asset for Munich 2018 on the eve of the Evaluation Commission visit," Munich 2018 CEO, Bernhard Schwank said. "Metro Group’s show of commitment at this crucial time confirms that German business has faith in Munich’s chances of winning this bid. This support will help us a great deal in the coming days." Metro Group is one of the world’s largest international retail networks, with some 290,000 employees from 180 nations working at 2,100 outlets in 33 countries in Europe, Africa and Asia. Metro Group joins Munich 2018's list of National Sponsors which includes Adidas, Allianz, BayWa, BMW, Bahn, Deutsche Post, Finanzgruppe, Munich Airport and Lufthansa.